Uber trumpeted its Q4/2017 financial statements as evidence of the company's progress towards CEO Dara Khosrowshahi's goal of profitability and IPO by 2019; the company argued that despite losing $4.5 billion in 2017, its cust-cutting in the final quarter of the year was proof that they would eventually go from losing money on each ride to actually earning money. But a closer examination of the figures shows that nothing of the sort is going on. The company's cost-cutting came mostly in the form of cuts to driver compensation, taking $2.2 billion out of drivers' pockets, meaning that Uber drivers are increasingly losing money with every drive (something that isn't apparent until you factor in the capital costs borne by drivers). 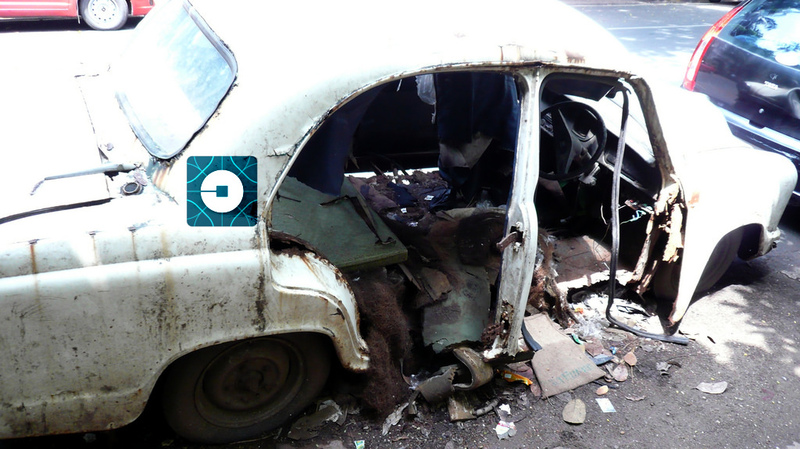 Uber drivers can drive for other companies, or get other jobs (that's key to Uber's claim that its drivers aren't employees, without which the company would be unambiguously doomed); its rival Lyft is happy to go on paying drivers more (for now), and drivers have already shown that it's pretty easy to ditch the platform, create their own app, and pocket 25% more than the company will pay them. So Uber's already losing drivers, and also they lost $4.6 billion -- and to become profitable, they'll have to find another $4.6 billion in cost-cutting, which is unlikely to come from drivers, whom they're actually going to have to start paying more if they want to continue to have cars on the street. For Uber to find an additional $4.6b/year in savings, there would have to be some indication that their costs were actually going down with scale. They're not. Insurance, a major cost to Uber, is rising linearly with revenue. Other costs have gone down thanks to deep cuts: Operations, Sales and Marketing, Research and Development, and General and Administration. Unless the company starts spending more on these, they will not continue to grow, and thus will continue to lose billions. What's more, Uber's figures are totally untrustworthy. Every financial report from Uber picks a different set of accounting practices, selected to cast their dismal finances in the best possible light (and even with that cherry-picking, Uber is still losing $4.5B/year!). So things are likely much, much worse. As ever, Hubert Horan is the best source on Uber Financial Kremlinology; since I wrote about his initial five deep dives in 2016, he's written eight more -- the latest one is where I found about about these balance-sheet shenanigans. All previous releases of Uber revenue data were limited to the top-line “Gross passenger payments” (the total money paid by passengers) and “Uber revenue”, the 20-30% of that total retained by Uber. In past analysis, I had assumed that the difference went almost entirely to drivers, but the newly released data shows this assumption is not true, and that Uber may be inflating the top-line revenue number. In 2017, roughly $3 billion of this revenue was “Refunds, Taxes and Fees” or “Rider Promotions.” Government charges and fares that are refunded should not have been included in the original gross revenue number. The “Rider Promotions” item is more problematic. If Uber offered discounts, the higher fare (that the passenger did not pay) appears to be included in gross revenue, while the promotional discount is a separate offset. These numbers do not affect bottom line P&L calculations, but inflating the top-line gross revenue number directly supports Uber’s desire to show the strongest possible passenger demand numbers. Uber has steadfastly refused to release any numbers (such as market-specific fare and yield trends) that would meaningfully document whether (or where) its revenue performance might actually be improving.